So I'm 3.5 hours into a long solo drive to Cape Canaveral Florida where I have a HOT date with a stranger I met online. 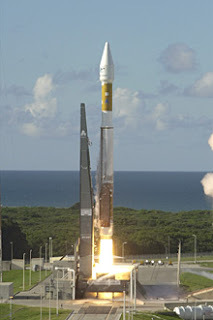 Hot as in over 627,000 lbs of liquid oxygen and a sweeet mix of rocket fuel propellants Hot. According to the countdown clock, my hot date is 4 days, 8 hours, 45 minutes and 57 seconds away. It seems my date is counting down the time even more closely than I. And, I might add, he has a whole team of brilliant engineers preparing him for the date. Each of the new satellites has a higher performance solar panel design to provide more spacecraft power. This upgrade will return signal processing for the S-Band multiple access service to the ground -- the same as the first-generation TDRS spacecraft. 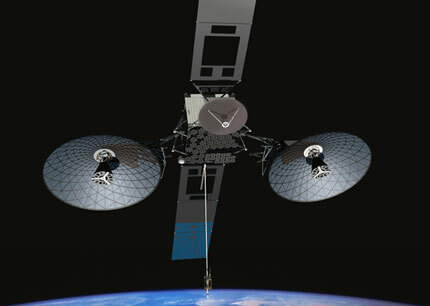 Ground-based processing allows TDRS to service more customers with different and evolving communication requirements. TDRS-K concept image from The Boeing Co.
OK, my rest stop is over. Back to the road I go. Errr... after I check Twitter to catch up with the other #NASASocial #TDRS attendees and see who is where and arriving when. See you there?! Are you a space geek? Find out if you have the right stuff to plot the course for future space missions - Take NASA's Quiz.